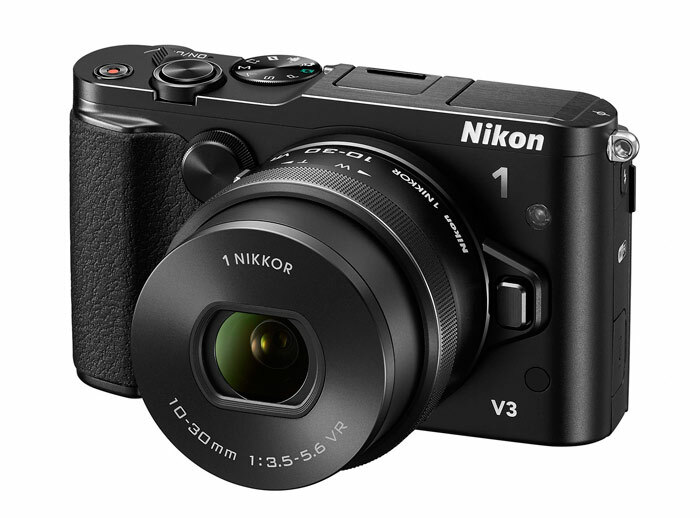 The Nikon 1 V3 boasts a more aesthetically pleasing design compared to the V2, but at the expense of the built-in Electronic Viewfinder (EVF), which has been removed. The V3’s strap line “I AM THE MASTER OF SPEED” tells us the big news is its performance capabilities. Appealing to action photography enthusiasts who want to travel light, the small bodied V3 offers burst shooting at 20fps with continuous AF, making it almost twice as fast as Nikon’s pro DSLRs. If you need even more speed though with focus locked to the first frame, the V3 crunches through 40 RAW files at a staggering 60 fps. To handle all that picture data, image processing gets a boost too, thanks to Nikon’s new EXPEED 4A image processor and its two processing engines. Nikon’s hybrid contrast/phase detection autofocus system from the V2 remains but with the number of autofocus points increased to 171, compared to 135 on the V2. What’s more 105 of the V3’s 171 AF points are the more accurate phase-detection variety, and with these located towards the centre of the frame the remaining contrast-detection points offer autofocus right to the edge. The new 18.4Mp CX-format sensor in the V3 offers an increase in resolution over its predecessor, the 14.2Mp V2, and has the optical low-pass filter removed to record sharper and more detailed images. The V3 also offers an extended ISO range of 160 – 12800, giving it an extra stop of low-light capability over the V2, which maxed out at ISO6400. Whilst these improvements are welcomed the physical size of Nikon’s 1” CX-format sensors will still be a concern for enthusiasts looking for top image quality. With mirrorless offerings from Sony and Fuji opting for large APS-C sensors and Olympus and Panasonic using the FourThirds variety, DxOMark Sensor Scores for the Nikon CX-format shows it can’t compete for image quality. On the plus side however the smaller sensor increases the crop factor to x2.7, which is a bonus for sports or wildlife enthusiasts attaching Nikon F mount lenses via the FT1 adapter. DxOMark Sensor Scores for Nikon’s 1” CX-format sensors have been disappointing compared to the mirrorless hybrid competition – look out for scores from the V3 in the coming days. Despite the Nikon 1 V3’s improvement in performance, increase in resolution and extra externally mounted controls for better handling, it’s hard to see who this camera is aimed at. The price tag of €949, including the new 10-30 f/3.5-5.6 PD-Zoom lens, certainly puts it in the serious enthusiast category, but which enthusiast? The fast frame rate and improved autofocus will be of interest to sports and wildlife enthusiasts, but there are currently no ‘fast’ aperture Nikon 1 telephoto lenses for them to use. Yes you can attach Nikon F mount lenses via an adapter but doing so significantly increases the overall size, so defeats the point of buying a mirrorless hybrid camera. Furthermore, whilst omitting the built-in EVF does make the V3 more attractive, compared to the V2, it also builds in limitations. Many enthusiasts will want to use an EVF and external flash, and while you can buy both separately, they both attach via a single accessory port so can’t be used simultaneously. 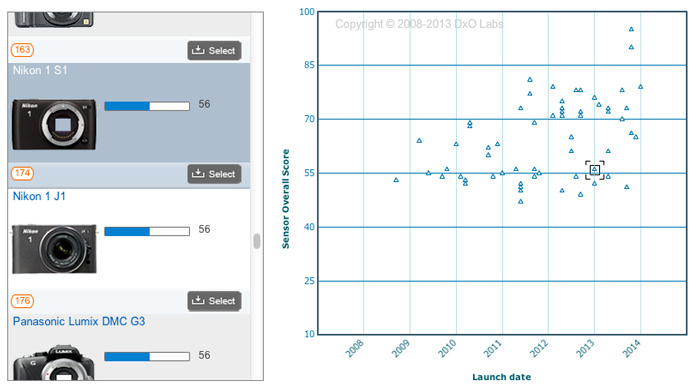 Finally previous DxO Sensor Scores from tested Nikon hybrid cameras using the 1” CX-format sensor have lagged behind much of the hybrid competition. It will be interesting to see if Nikon have managed to make any improvement in this regard as we test the Nikon 1 V3 in the coming months. Without a significant improvement however and cheaper hybrid competition like the Sony NEX-7 boasting better image quality and a built-in EVF it’s going to be a hard sell for the Nikon 1 V3.